A CVS Pharmacy® gift card is always a great choice. 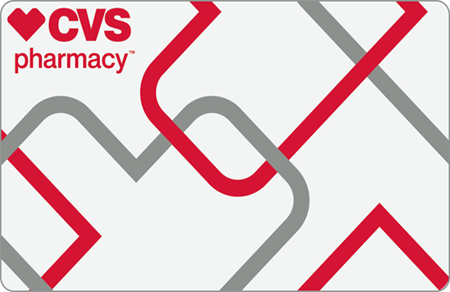 With more than 7,800 locations from coast to coast, CVS Pharmacy is the most convenient place to get the prescription medications and healthcare products you need. Plus, it provides a huge selection of popular beauty and personal care brands as well as exclusive brands you won’t find anywhere else. Why choose CVS Pharmacy gift cards? Q. What gift card types are available? CVS Pharmacy gift cards are available in both plastic and digital formats. Yes, a minimum opening order for gift cards is $500 at face value and a minimum of 10 gift cards. Thereafter, you can place gift card orders as needed. Yes, we offer several discount levels for gift card purchases based on annual volume. Your choice of gift card denominations range from $5 to $500. Yes, your gift card order can include any denomination you choose but orders must be placed in 10 card increments. All gift card orders require payment with order. You can pay by company check or ACH. Gift cards are shipped in bulk via FedEx 2-Day delivery to a single location. No, gift cards are not shipped activated. Cards must be activated upon confirmed receipt and after confirmed receipt of cleared funds. Q. How do I activate my gift cards? You can request gift card activation by e-mail. Note: For faster activation please include the PO# that was included on your packing slip. No, the value of the gift card does not appear on the card but you can check the balance of your gift card online or by calling 1(888) 607-4287. No, the gift cards have no expiration dates. No, the gift cards have no dormancy fees or other fees. No, the gift cards can be redeemed for merchandise only. Not redeemable for cash or credit except where required by law. Gift cards can be redeemed at any of the 7,800 CVS Pharmacy store locations in the United States as well as any Long’s Drug Store. Q. Are there restrictions on what can be purchased with the gift cards? Yes, while the standard CVS Pharmacy gift cards can be used to purchase merchandise, including prescriptions or co-pays, they cannot be used to purchase prepaid cards or any money order product. No, once activated, gift cards are treated as cash. We are not responsible for lost or stolen gift cards. Gift cards are available in flexible denominations and are reloadable from $5 to $500 to meet your healthcare rewards needs. This gift card can only be used for the purchase of health-related items and cannot be used to purchase money orders or prepaid cards. Not redeemable for cash or credit except where required by law. This gift card has no expiration date and no dormancy or inactivity fees will be charged. Gift card retains unused balance and is rechargeable. Redeemable at over 7,800 CVS Pharmacy locations* across the U.S.
*CVS Pharmacy Flu Shot eGift Cards can only be used at CVS Pharmacy. CVS Pharmacy Flu Shot eGift Cards cannot be used online at CVS.com, or to purchase gift cards or prepaid cards for any other retailers that CVS Pharmacy stores may carry. Vaccinations available when immunizing pharmacist is on duty, while supplies last. Eligible Medicare Part B patients will not pay any copayments unless otherwise required by their plan. Prescription may be needed in certain states, including GA, MD, NC & SC. Patients 18 months and older, 24 months and older in MA, 5 years and older in CT.